Healthy Habits / Is my kiddo too big for his baby tub? Your baby has grown a lot, and now he is probably too big for the sink or his baby tub. Plus, he is splashing everywhere! If you’re wondering what you should do, here are a few options. You can choose to get a bigger, portable tub for your baby and place it in the bathtub. To prevent slips, first place a rubber mat on the bottom of the large bathtub and then place your child’s tub in. You don’t necessarily have to use a portable bath at all. If your baby can sit up alone without any support, he is ready for this big step! All you need is a rubber mat at the bottom of the tub and his bath toys. Your child will have ample space to play in, so he probably won’t want to get out. Now, despite having more control over his body, he is still needs your absolute attention. It is important to fill the tub with little water, to prevent accidents. Check the water temperature with your elbow before putting your baby in. Don’t answer the phone or sort out other issues during this process. If you have an emergency while bathing your little one, first take him out, wrap him in his towel, and take him to a safe place before you attend to anything else. 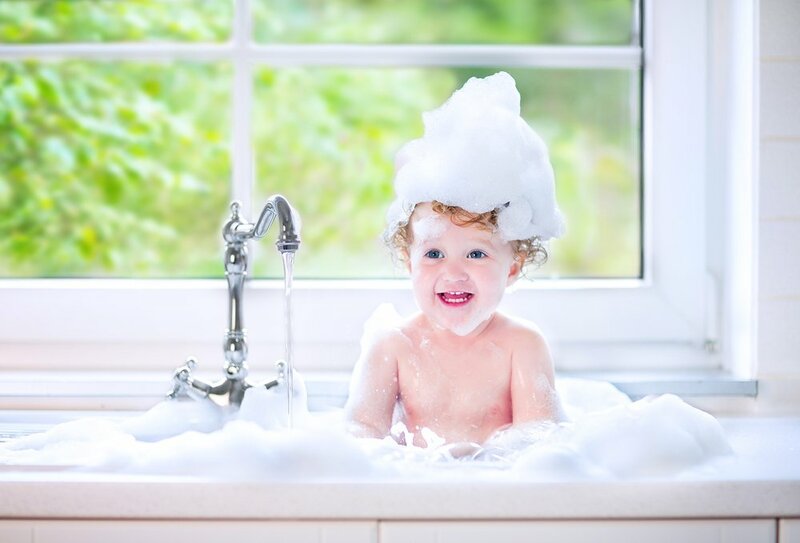 Don’t forget to make bath time a fun and relaxing time for your baby! It’s okay if there are no bathtubs in your home. You can choose a larger portable bath and place it in a shower. If your baby can sit up unsupported, he’ll be able to splash around in his comfortable bath and the water will fall into the shower. Bathing him in the shower is very simple; you must first place a non-slip mat so that his bathtub won’t move. When the tub is placed safely, fill the tub with warm water and check the temperature with your elbow or inside part of your wrist. Try to wear comfortable clothes; you’ll have to crouch down and sit on the floor. It is very important to never take your eyes off your baby; accidents can happen in seconds. So if for some reason you have to leave your little one, first take him out of the bathtub, cover him with his towel, put him in a safe place, and then attend to anything else. Bath time is a great way to start a sleep routine, so try to make it a pleasant time and show a lot of love.